WASHINGTON (CNN) -- Afghanistan's president Tuesday praised U.S. plans to provide more civilian help to his country, and expressed hope that the country become less dependent on international partners in coming years. Hamid Karzai departs after registering as a candidate for August presidential elections in Kabul on Monday. But President Hamid Karzai -- in Washington this week along with Pakistani President Asif Ali Zardari to meet with U.S. leaders -- stressed that Afghanistan's stability depends on whether Taliban strongholds in neighboring Pakistan are confronted. U.S. 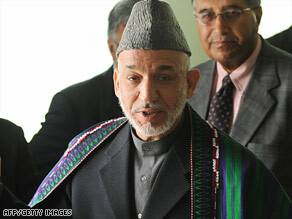 Ambassador Richard Holbrooke "had the best remark that I've ever heard from a U.S. official," Karzai said. "He said no matter how economically powerful Afghanistan is or becomes, no matter how effective a government Afghanistan has, no matter how powerful an army and the security institution of Afghanistan is, unless the sanctuaries of our neighbors, the training grounds of our neighbors, go away, Afghanistan will not be stable or peaceful." Addressing the re-emergence of Taliban militants, who were ousted from power by a U.S.-led coalition after the September 11 attacks on the United States, Karzai said, "We did not address the question of sanctuaries in time," a reality, he said, that hurts Afghanistan and Pakistan. "We must seek from Pakistan a very clear moving away from whatever linkage that there may be with radical forces or the use of radicalism. Unless we do that, we will continue to be bogged down. We will continue to suffer," Karzai said. Taliban gains in Pakistan are a major theme this week in Washington, where Karzai and Zardari will be visiting key congressional leaders and policymakers before meeting with President Obama and Secretary of State Hillary Clinton. Karzai, who made his remarks as Holbrooke testified about the problems in the region before the House Foreign Affairs Committee, touched on Obama's strategy, announced in March, to fight the Taliban in Afghanistan and Pakistan. He said the most important element is the "civilian surge" -- the dispatching of experts to Afghanistan to help the country produce more effectively in all sectors of the infrastructure and economy, including agriculture, water management and economic activity. Obama said sending "agricultural specialists and educators; engineers and lawyers" to Afghanistan will help "advance security, opportunity and justice" across the country. Karzai said the program will work if it is carried out "with the requirements of Afghanistan, with the plans of Afghanistan shared and supported by and agreed with by the United States, and in a manner that will add to Afghan capacity building." The Enhanced Partnership with Pakistan Act of 2009 would authorize $7.5 billion in nonmilitary aid to Pakistan over the next five years to foster economic growth and development, and another $7.5 billion for the following five years. "Five years from now, 10 years now, when your experts go back home with a lot of graduates from Afghanistan," Karzai said, "they will have Afghans trained in their place to take on and take the country forward." He said it is important that Afghans trust in the war against terrorism and "don't suffer the consequences of it as they do suffer today," a reference to Afghan civilian casualties in battle. It's important, he said, that Afghans see the war bringing them "safety and security," and improved security forces that can defend the country. Karzai is running for re-election and has announced two running mates: current Vice President Kamil Khallili and a controversial former warlord, Mohamed Fahim. Fahim was defense minister and vice president in a transitional government after the U.S.-led invasion that toppled the Taliban government in 2001, but Karzai did not include him on the ticket when he was elected in 2004. Human Rights Watch was quick to criticize Karzai's decision to add him to the ticket. Karzai defended Fahim, saying he "will be a factor of stability and unity for the Afghan people," noting that he has "contributed immensely in the war against terrorism, shoulder to shoulder with U.S. soldiers in Afghanistan." The president said he looks forward to a proper race. "For me, as the president of Afghanistan today, there will be no greater accomplishment ... but one in which I am either elected in a fair election or defeated in a fair election."